Fri, Mar 16, 2018, 11:50 pm SL Time, ColomboPage News Desk, Sri Lanka. 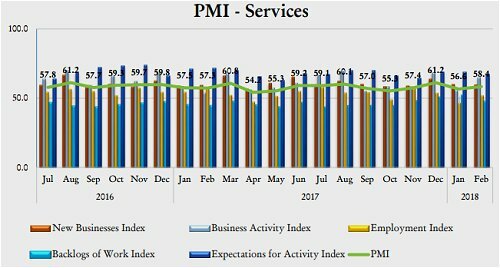 Mar 16, Colombo: Both manufacturing and service sectors of Sri Lanka expanded at a higher rate in February 2018, compared to the previous month, the Central Bank's Purchasing Managers' Index (PMI) Survey released for the month showed. According to the survey, the Manufacturing PMI recorded 55.6 index points in February 2018 from 51.7 index points in January while the Services Sector PMI increased to 58.4 index points in February 2018 from 56.6 index points in January. Manufacturing activities expanded at a higher rate in February compared to January 2018 after the seasonal slowdown observed during the previous month. This was mainly driven by the expansion in the New Orders sub-index, the Central Bank said. The Production sub-index also increased with the increase in new orders Nevertheless, this increase was relatively low compared to that of new orders due to lesser number of working days in February. Further, Stock of Purchases sub-index also expanded during the month while Employment sub-index expanded marginally. Meanwhile, the Suppliers� Delivery Time sub-index lengthened at a higher rate compared to previous month. Overall, all the sub-indices of PMI recorded values above the neutral 50.0 threshold signaling an overall expansion in manufacturing activities during the month. Moreover, the expectation for activities indicates an improvement for the next three months. Services sector also gathered momentum in February 2018 supported by New Businesses, Business Activity, Employment and Expectations for Activity. A steeper gain was observed in the business activities of the Financial Services; IT programming; and Transportation of goods and warehousing sectors. Meanwhile, employment increased in February 2018 in contrast to the decline observed in January, and was prominent in the Wholesale and Retail Trade sector. Backlogs of Work declined in February 2018, reversing its trend observed during the past two months, partly caused by increase in employment due to new recruitments. Service providers� optimism on the three-month business outlook also strengthened at a modest pace. Expected Labor Cost increased compared to the previous month due to expected salary increments in 2018, while Prices Charged of the Services sector increased, albeit at a slower rate.